Balancing the demands of career and motherhood is no easy task. Eating healthy, nutritious foods while avoiding weight gain can be difficult for the career woman whose life never seems to slow down. After all, we come to work, there is fast food available, there’s the burrito truck out back, or there’s the vending machine, the coffee machine … It’s hard to stay slim with these sorts of temptations all around you! So how do we eat healthy at work? First of all, you have to plan ahead. The truth is, a lot of times busy women tend to skip breakfast altogether. You need to eat a healthy breakfast at home before you get to work. That helps get rid of hunger pangs at the office. Unfortunately, in the morning, we’re typically in a hurry and we’re rushing to get out the door. As a result, we don’t eat breakfast and then we get to work and just grab what’s available. That usually means something from the vending machine, or those donuts in the break room. You want to try to avoid these sorts of junk food temptations. Really, the best thing you can do to stay away from unhealthy foods at the office is to eat a healthy breakfast at home! What are some examples of a healthy breakfast? Oatmeal is my favorite. Whole grain cereals are also a good way to start the day, with fruit and skim milk or soy milk. Below are some examples of things we can prepare at home and carry to work with us. You should plan these things while your tummy is full, so that you are making healthful choices. You want to have a supply of healthy food at work. You can keep it in the office fridge, or you can bring a container from home each day. Fruit is always a great and easy choice. It’s nutritious and low in calories. An apple, a banana, and orange – you can put it in your purse. Another good food to take to the office is instant tuna salad to go. It comes with chunk light tuna in water with crackers. Add a little bit of relish and mayonnaise, and you’re good to go. Just throw it in your purse. Tuna is a delicious snack, high in protein, that fills you up. How about string cheese and baby carrots? I’ve got news for you – they’re not just for kids. You can buy little packets that are already prepared and keep them at work and eat them as a snack to take care of those hunger pangs. Thinking ahead and preparing healthy foods that you can carry with you helps you to make better, more nutritious snack choices when you’re under stress at the office. Juice contains a lot of calories. I always tell my patients, if you’re watching your weight, don’t drink you calories. Pure water is always a better choice. Another great choice for a healthy snack is low-fat or fat-free yogurt. Cottage cheese is another terrific option; it’s low in calories and contains a nice dose of bone-building calcium plus protein to take the edge off your hunger. Last but not least, there’s that old-fashioned tradition of brown-bagging your lunch. Packing your own lunch is a good way to control what goes into your body. A sandwich made from whole grains, a lot of vegetables, some fruit – you can’t beat it for taste and nutrition. Another one of my favorites you can buy at the supermarket these days is vegetable sushi. It makes for a nutritious and low-calorie lunch. You can eat healthy at work if you plan ahead and pack nutritious, low-calorie snacks. Janet Brill, Ph.D., R.D., LDN, is a leading diet, nutrition, and fitness expert specializing in cardiovascular disease prevention. She is the author of Cholesterol Down: 10 Simple Steps to Lower Your Cholesterol in 4 Weeks – Without Prescription Drugs (Three Rivers Press, 2006), Prevent a Second Heart Attack: 8 foods, 8 Weeks to Reverse Heart Disease (Three Rivers Press, Feb. 2011), and Blood Pressure Down, The 10-Step Plan to Lower Your Blood Pressure in 4 Weeks (Three Rivers Press, April 2011). To learn more about Dr. Janet, get delicious heart-healthy recipes, or buy her books, please visit DrJanet.com or Blood Pressure Down. 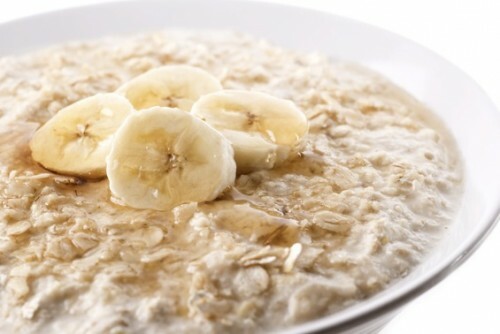 Oatmeal: Have a Bowl of Heart Health! Try not eat after 8 o’clock at night. You’re more likely to make unhealthy food choices and less likely to sleep well after having a late meal.